Image example Atiku say im defeat president Muhammadu Buhari of All Progressives Congress with over 1.6 million votes. Presidential Election Petition Court for Nigeria on Wednesday permit main opposition PDP candidate, Atiku Abubakar to challenge result of di 2019 presidential election wey President Muhammadu Buhari win. Atiku Abubakar petition before di Presidential Election Petition Tribunal na say di ruling APC party use mago mago win di election and say na im be di real winner. 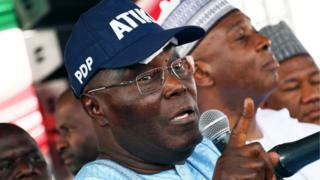 Di Tribunal give go ahead to Peoples Democratic Party, PDP candidate Atiku Abubakar to serve President Muhammadu Buhari and im party All Progressives Congress, APC im petition wey challenge di February 23 elections through indirect means. Di three-member panel of di tribunal wey Appeal Court justice, Abdul Aboki, dey lead agree wit di arguement of di PDP lawyer Chris Uche wey file di application. Oga Uche and im team bin cari di matter go di tribunal afta dem chook eye inside di tins wey Nigeria election office - Independent National Electoral Commission, (INEC) use to conclude afta di February 23 election. Oga Abubakar reject di results and ask di tribunal make dem allow am to check di same item dem wey INEC use for collation. Afta dem grant dem dia request to check di election materials dem, Oga Abubakar say im lawyers find out say im defeat president Buhari with over 1.6 million votes.